Former BBC journalist describes life her new life in the convent. 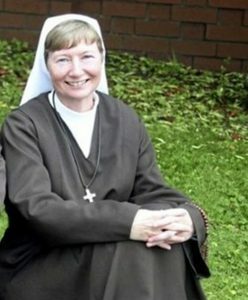 A journalist who worked for 20 years as a political correspondent in Northern Ireland has described in moving terms her call to religious life and the joy of life in the convent. Martina Purdy entered the Adoration Sisters on the Falls Road, Belfast, in 2014. Up to that point she had enjoyed a successful career as a BBC television journalist, covering landmark political events like the signing of the Good Friday Agreement. She had also worked for the Belfast Telegraph. Despite a life that many would envy – a great job, foreign holidays, a lovely apartment – it did not satisfy her. In 2013, Sr Purdy travelled to Lima, Peru, but enjoying a lavish holiday surrounded by poverty did not sit well with her. In the church of St Martin de Porres she asked Jesus to help her change. “To be more centred on him, not on me,” Sr Purdy said during an interview on Today with Sean O’Rourke. She approached a local priest, who also happened to be the director of vocations for the diocese of Down and Connor, and on the train back from a North–South ministerial meeting, signed up for a retreat. Sr Purdy told Sean O’Rourke that she considered her entry into religious life very carefully. She realised there could be no return to the BBC if she changed her mind. She weighed up the consequences – not marrying, not having a family. “To my shame, I counted the cost before I went in. Some of her colleagues wanted to stage an intervention to whisk her away from the convent, believing she was having a mid-life crisis. But when they saw how happy she was, they changed their minds. *This year’s Faith & Life Convention takes place today, Saturday, 29 September in Our Lady and St Patrick’s College, Knock, Belfast, with registration at 9am. The Faith and Life Convention is a forum for people from across the diocese and beyond, to gather together and take part in a range of conversations about the meaning of faith and its relevance to every area of our lives. The keynote speaker at this year’s event is Cardinal Cardinal Óscar Andrés Rodríguez Maradiaga, S.D.B. See the convention website for further information.